From gift guides to giveaways, we Crusaders always have our eyes out for new cupcake related items. It really is amazing how the cupcake trend has taken the entire shopping world by storm in the past couple of years. Recently, Healthy Crusader Rebecca brought me a Crumbs Red Velvet Cupcake chocolate bar. (Of course the Red Velvet Crusader has to taste test anything Red Velvet.) As if Crumbs cupcakes weren’t grand enough, now they can temp consumers with chocolate bars too?! Red Velvet cake batter in “fine Belgian” milk chocolate with bits of cream cheese frosting make up this sweet treat. Smooth and creamy with the perfect balance of savory cocoa and sweet, this red velvet chocolate bar is better than most Red velvet cupcakes I have tasted. 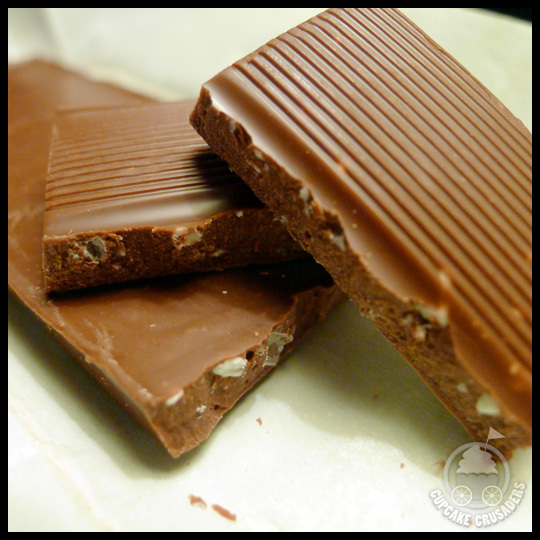 The slightly red chocolate has the perfect texture and melts in your mouth. While I didn’t taste the cream cheese frosting bits, I could see them throughout the chocolate. I had to stop myself from eating the entire bar all in one sitting. Who would have thought that one of my favorite Red Velvet cupcakes would become a chocolate bar? Granted, all three of us Crusaders enjoy a good chocolate bar and sweets in general, but of course we prefer cupcakes. 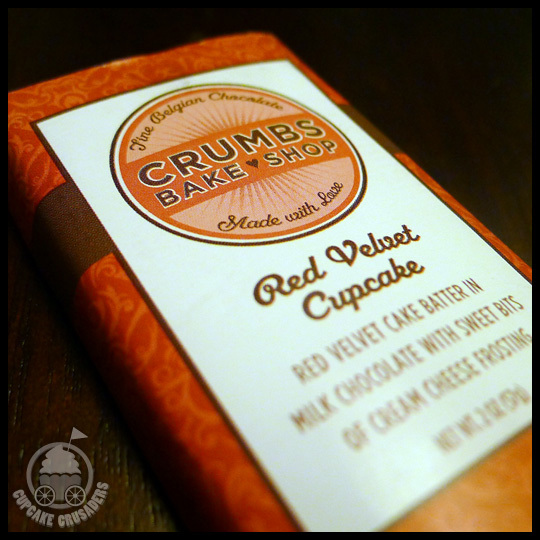 This chocolate bar is one I would buy and eat again, and now with two locations in the Baltimore area (Columbia and Towson), and locations popping up all over the nation, you can get delicious Crumbs cupcakes or chocolate bars anytime you want. It’s great to see cupcake flavors branching out into other “foodie” realms, and the next time I am at a Crumbs you can be sure I will be buying both cupcakes AND chocolate bars. Special thanks to Healthy Crusader Rebecca for this special treat! This entry was posted in Baltimore, Maryland and tagged Chocolate bar, Cream cheese, crumbs, Cupcake, Healthy Crusader, Rebecca, Red Velvet by Crusader Elisa. Bookmark the permalink. mmm, cupcake in a conveient to go wrapper.